Cholesteryl ester transfer protein (CETP), also called plasma lipid transfer protein, is a plasma protein that facilitates the transport of cholesteryl esters and triglycerides between the lipoproteins. It collects triglycerides from very-low-density (VLDL) or low-density lipoproteins (LDL) and exchanges them for cholesteryl esters from high-density lipoproteins (HDL), and vice versa. Most of the time, however, CETP does a heteroexchange, trading a triglyceride for a cholesteryl ester or a cholesteryl ester for a triglyceride. The CETP gene is located on the sixteenth chromosome (16q21). Rare mutations leading to reduced function of CETP have been linked to accelerated atherosclerosis. In contrast, a polymorphism (I405V) of the CETP gene leading to lower serum levels has also been linked to exceptional longevity  and to metabolic response to nutritional intervention. However, this mutation also increases the prevalence of coronary heart disease in patients with hypertriglyceridemia. The D442G mutation, which lowers CETP levels and increases HDL levels also increases coronary heart disease. Elaidic acid, a major component of trans fat, increases CETP activity. As HDL can alleviate atherosclerosis and other cardiovascular diseases, and certain disease states such as the metabolic syndrome feature low HDL, pharmacological inhibition of CETP is being studied as a method of improving HDL levels. To be specific, in a 2004 study, the small molecular agent torcetrapib was shown to increase HDL levels, alone and with a statin, and lower LDL when co-administered with a statin. Studies into cardiovascular endpoints, however, were largely disappointing. While they confirmed the change in lipid levels, most reported an increase in blood pressure, no change in atherosclerosis, and, in a trial of a combination of torcetrapib and atorvastatin, an increase in cardiovascular events and mortality. A compound related to torcetrapib, Dalcetrapib (investigative name JTT-705/R1658), was also studied, but trials have ceased. It increases HDL levels by 30%, as compared to 60% by torcetrapib. Two CETP inhibitors are currently under development. One is Merck's MK-0859 anacetrapib, which in initial studies did not increase blood pressure. The other is Eli Lilly's evacetrapib, which failed in Phase 3 trials. ↑ "Diseases that are genetically associated with CETP view/edit references on wikidata". 1 2 Zhong S, Sharp DS, Grove JS, Bruce C, Yano K, Curb JD, Tall AR (June 1996). "Increased coronary heart disease in Japanese-American men with mutation in the cholesteryl ester transfer protein gene despite increased HDL levels". J Clin Invest. 97 (12): 2917–23. doi:10.1172/JCI118751. PMC 507389 . PMID 8675707. ↑ Barzilai N, Atzmon G, Schechter C, Schaefer EJ, Cupples AL, Lipton R, Cheng S, Shuldiner AR (October 2003). "Unique lipoprotein phenotype and genotype associated with exceptional longevity". JAMA. 290 (15): 2030–40. doi:10.1001/jama.290.15.2030. PMID 14559957. ↑ Darabi M, Abolfathi AA, Noori M, Kazemi A, Ostadrahimi A, Rahimipour A, Darabi M, Ghatrehsamani K (2009). "Cholesteryl ester transfer protein I405V polymorphism influences apolipoprotein A-I response to a change in dietary fatty acid composition". Horm Metab Res. 41 (7): 554–8. doi:10.1055/s-0029-1192034. PMID 19242900. ↑ Bruce C, Sharp DS, Tall AR (1 May 1998). "Relationship of HDL and coronary heart disease to a common amino acid polymorphism in the cholesteryl ester transfer protein in men with and without hypertriglyceridemia". J Lipid Res. 39 (5): 1071–8. PMID 9610775. ↑ Abbey M, Nestel PJ (March 1994). "Plasma cholesteryl ester transfer protein activity is increased when trans-elaidic acid is substituted for cis-oleic acid in the diet". Atherosclerosis. 106 (1): 99–107. doi:10.1016/0021-9150(94)90086-8. PMID 8018112. ↑ Barter PJ, Brewer HB, Chapman MJ, Hennekens CH, Rader DJ, Tall AR (February 2003). "Cholesteryl ester transfer protein: a novel target for raising HDL and inhibiting atherosclerosis". Arterioscler Thromb Vasc Biol. 23 (2): 160–7. doi:10.1161/01.ATV.0000054658.91146.64. PMID 12588754. ↑ Brousseau ME, Schaefer EJ, Wolfe ML, Bloedon LT, Digenio AG, Clark RW, Mancuso JP, Rader DJ (April 2004). "Effects of an inhibitor of cholesteryl ester transfer protein on HDL cholesterol". N Engl J Med. 350 (15): 1505–15. doi:10.1056/NEJMoa031766. PMID 15071125. ↑ Nissen SE, Tardif JC, Nicholls SJ, Revkin JH, Shear CL, Duggan WT, Ruzyllo W, Bachinsky WB, Lasala GP, Lasala GP, Tuzcu EM (March 2007). "Effect of torcetrapib on the progression of coronary atherosclerosis". N Engl J Med. 356 (13): 1304–16. doi:10.1056/NEJMoa070635. ISSN 0028-4793. PMID 17387129. ↑ Kastelein JJ, van Leuven SI, Burgess L, Evans GW, Kuivenhoven JA, Barter PJ, Revkin JH, Grobbee DE, Riley WA, Shear CL, Duggan WT, Bots ML (April 2007). "Effect of torcetrapib on carotid atherosclerosis in familial hypercholesterolemia". N Engl J Med. 356 (16): 1620–30. doi:10.1056/NEJMoa071359. PMID 17387131. ↑ "Pfizer Stops All Torcetrapib Clinical Trials in Interest of Patient Safety" (Press release). U.S. Food and Drug Administration. 2006-12-03. ↑ El Harchaoui K, van der Steeg WA, Stroes ES, Kastelein JJ (August 2007). "The role of CETP inhibition in dyslipidemia". Curr Atheroscler Rep. 9 (2): 125–33. doi:10.1007/s11883-007-0008-5. PMID 17877921. ↑ de Grooth GJ, Kuivenhoven JA, Stalenhoef AF, de Graaf J, Zwinderman AH, Posma JL, van Tol A, Kastelein JJ (May 2002). "Efficacy and safety of a novel cholesteryl ester transfer protein inhibitor, JTT-705, in humans: a randomized phase II dose-response study". Circulation. 105 (18): 2159–65. doi:10.1161/01.CIR.0000015857.31889.7B. PMID 11994249. ↑ Reuters (2007-10-04). "Merck announces its investigational CETP-Inhibitor, MK-0859, produced positive effects on lipids with no observed blood pressure changes". Reuters, Inc. Retrieved 26 November 2013. Okajima F (March 2002). 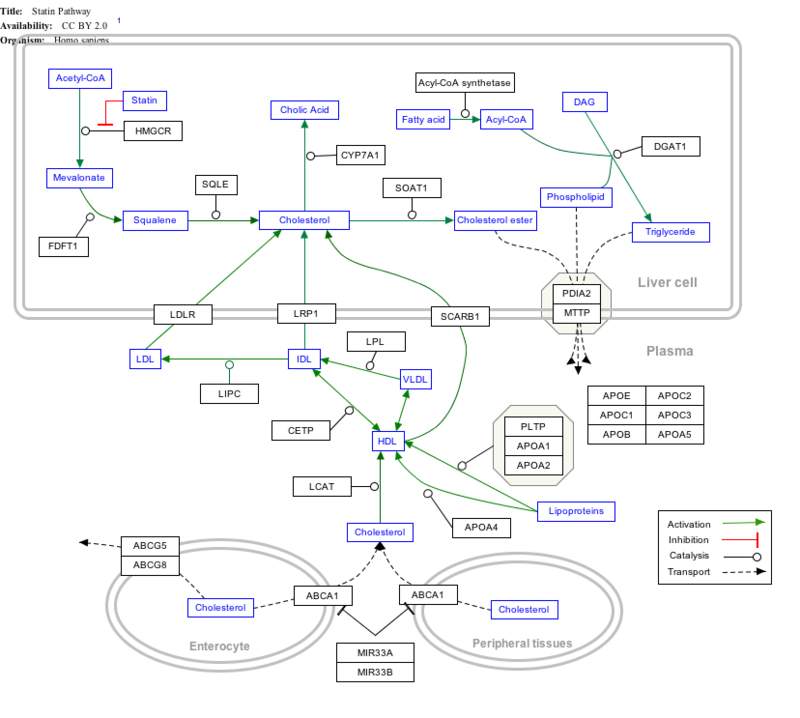 "[Distribution of sphingosine 1-phosphate in plasma lipoproteins and its role in the regulation of the vascular cell functions]". Tanpakushitsu Kakusan Koso. 47 (4 Suppl): 480–7. ISSN 0039-9450. PMID 11915346. Barter PJ, Brewer HB, Chapman MJ, Hennekens CH, Rader DJ, Tall AR (February 2003). "Cholesteryl ester transfer protein: a novel target for raising HDL and inhibiting atherosclerosis" (Free full text). Arterioscler. Thromb. Vasc. Biol. 23 (2): 160–7. doi:10.1161/01.ATV.0000054658.91146.64. ISSN 1079-5642. PMID 12588754. Dallinga-Thie GM, Dullaart RP, van Tol A (June 2007). "Concerted actions of cholesteryl ester transfer protein and phospholipid transfer protein in type 2 diabetes: effects of apolipoproteins". Curr. Opin. Lipidol. 18 (3): 251–7. doi:10.1097/MOL.0b013e3280e12685. ISSN 0957-9672. PMID 17495597.